I bake a sponge cake for family birthdays, just like my mother did for us. She got the recipe from my Jewish grandmother, who had adapted it from Meta Given. Something got lost in translation. Actually, it was the opposite of lost. My mother accidentally doubled the sugar, and the result was divine. The cake isn’t that sweet (it tastes tart from the lemon) but the sugar creates a crunchy crust. It does not need frosting. Note that there is no cooking fat/oil in the recipe. 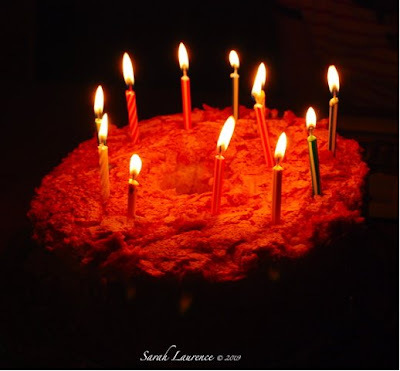 This cake is a traditional Jewish delicacy, especially if you use leftover Hanukkah candles for the birthday child. Maybe the reason I dislike baking is because this recipe is a killer. To make the sponge light and spongy, you need to resift flour and master the technique of cut and folding batter into the egg whites. I learned by watching my mother. While baking, the cake rises almost like a soufflé. My mother used to say it would collapse if we made too much noise (ha!) That bought an hour and a quarter of silence, especially because my brother and I had our tongues engaged licking mixing bowls. That was back when moms didn’t freak out about salmonella. It’s interesting how hazards haven’t increased but our awareness and fear have. It’s a pain getting the cake out of the tube pan. I often wonder if a spring-form pan would work better, but I’m a creature of habit. I’m also a creature of careless mistakes. I planned to post this recipe when I made it last time, but it was a disaster. The cake didn’t rise, or rather it did rise in the oven and then collapsed while it cooled. Was my mother right about the noise after all? It still tasted good, but the texture was too dense and heavy. I figured out the mystery this time. There were two cans of baking powder in my pantry: the fresh one, and one that was so old it had a sticker from Star Market in Massachusetts. We moved to Maine 12 years ago. This is why I should not bake anything more complicated than brownies from a mix. Still, this cake is so absolutely delicious, that it’s worth the effort. I baked it for my daughter's 12th birthday this month. Use 10 inch tube pan – do NOT grease. Start oven 10 mins before baking at 325 F.
Sift flour, measure, resift 3 times with baking powder, salt and 3/4 cup sugar. Put egg whites into a 4 qt. mixing bowl and set aside. Put egg yolks into a large mixer bowl, add water and lemon juice then beat at medium speed until thick and spongy (see bubbles) in about 4-5 min. Without stopping beaters, add 3/4 of remaining sugar gradually and vanilla and beat until the mixture is again thick and spongy. Turn mixer to lowest speed and add flour in 4 portions, scraping sides and bottom of bowl constantly with rubber scraper. Beat until batter is just smooth. Now stop beating. Add lemon rind to yolk mixture. With a rotary beater (or hand electric) quickly beat egg whites until stiff enough to form shiny peaks. 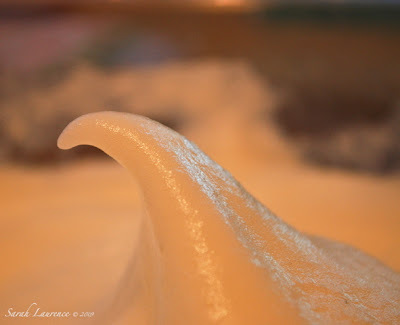 Then beat in remaining 1/4 cup sugar gradually until whites form shiny peaks that curve at tips (above photo.) With a rubber scraper, cut and fold yolk mixture into whites, lightly but thoroughly. Flow batter into pan. Remove from oven and invert over large funnel or bottle. When just cooled (30-45 mins.) remove from pan. Serve with vanilla ice cream (Haagen Dazs is best) and fresh sliced strawberries. Blog watch: It’s fun to connect with bloggers from far away. Sapphire in Japan blogged about a beautiful sculpture garden in Hakone and a horrible theft of a Henry Moore sculpture. The crime defies imagination both as to the means and the ends. Another newbie to my blog, Delwyn@a hazy moon posts gorgeous nature photos from Australia. Phoenix@Talking to Myself blogged about her new hometown of Delhi. Cynthia@Oasis Writing Link in Puerto Rico also gave us a tour of her hometown. Mama Shujaa revisited Nairobi, where she grew up. Globe trotting is so easy in cyberspace. Helpline: Why Does my Sponge Cake Collapse? See Phillip's second comment below: inversion helps cake firm up as it may collapse when hot - do this until it cools. Along the same line, opening the oven too many times to check the cake will cool it and might make it collapse. You forgot to add a rising agent like baking powder/self-rising flour or it has expired. Not enough egg white. If using smaller, organic eggs, try adding 1 or 2 extra egg whites (not the yolks). Not beating the egg whites enough or letting them sit too long. Use an electric beater or enlist a helper if you get too tired. The whole prep should not take more than hour. Bake immediately. The cake can sit all day until you eat it. that is an interesting cake.Why do you invert it at the end? and how is it balancing there? I will be trying this recipe and I can only hope it turns out like your picture. I think it's neat when you have a family recipe that is handed down from family to family--I feel it makes the recipe more special. Your blog was great, as were the photos of what you accomplished -- just beautiful!!! -- but your grandmother Golden was not the origin -- the cookbook that I'd bought in college was the origin -- with the important modification, of my mistake with the sugar & using extra large size eggs. Golden gave me many really fine recipes and she was a fine cook, generally -- but I didn't like her sponge cake -- nor her home made mazzah balls (Zabars, I thought, were better). Dad, apparently, thought, all along, that Golden (with the modification) was the origin -- I hadn't even realized that! However, I did receive and still use many really great recipes from Golden! But the blog, generally, is quite lovely. Thank you!!! I'm very amused by the image of your suicidal mixer. 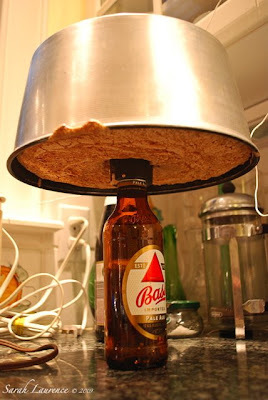 This is very similar to how I make an angel food cake and I invert it on a bottle just like in your photo. Delwyn, great question! I’ve watched my mother bake this cake for so many years that I never questioned the procedures. I just called my mother to thank her for pointing out the mistaken family myth (read the “CORRECTION” comment.) She wasn’t sure either but said you always invert cakes like that. [Phillip does it for his cakes too - comment above.] Maybe it keeps the cake from collapsing? The balancing act is easier than it looks but still tricky as the cake is hot. It does not fall out of the pan because the batter has expanded like a sponge and there is no grease on the pan. A large metal funnel would be more stable, but I don’t have one. Don’t use plastic as it might melt. Tracy, be sure to read the CORRECTION comment below yours. Even now that the family myth has been broken, it still is a 2 generation and soon to be a 3 generation cake. I’m dreaming of the day when my kids will bake one for me. They are more into baking than I am. Good luck with the recipe! Mom, thanks so much for the recipe and the correction to the family myth. That is so, so funny that Dad believed the recipe came from his mother instead of your cookbook. He had asked you to make his mother’s sponge cake, which wasn’t as good. We might have never known the true story had I not blogged about it. This cake seems to be the sponge for soaking up mistakes but good ones. It’s a testimony to your cooking that even your errors improve a recipe. I hadn’t realized the extra large eggs were your addition, but that makes sense since they must make the cake all the more light and airy like an Angel Food Cake. I have never tasted a cake I like better, but maybe part of it is that is the taste of home. All the hard work shows love. Thank you! Phillip, my mother and I bake and invert Angel food cakes too, but this cake is tastier. Egg yolks might not be as good for you as the whites, but they bring flavor and texture. Delwyn asked why the cake needs to be inverted. Do you know why? Sarah, your story touched on so many memories of my mom's angel food cake and those same dire warnings. Don't slam the door! Tiptoe, don't run through the kitchen! I love to bake but don't usually care for taking the trouble to prepare sponge cake. I just might have to make an exception, though, and try your family recipe. It looks exquisitely yummy! Do your children watch you prepare the cake so they can continue the tradition? A cake with this type of structure is a bit unstable when still hot. It is likely to fall if cooled upright. Inverting gives the cake time to firm up as it cools. Elevating it provides air circulation all around the cake, allowing it cool more quickly, without getting soggy. Oh gosh, baking is one of my most favourite activites ever. But my dear, you need a new mixer! No walking across the counter allowed!! A Kitchenaid.... get a Kitchenaid! One of those will make baking more fun, I swear. I bet you can guess that I'm excited about the upcoming Julia Child movie, can't you?! The recipe looks delcious, too! Thanks for sharing! I agree with Pamela. Get a KitchenAid and whipping up egg whites will be a dream! I'm excited to see a recipe on your blog . . . even if the origins of said recipe do not go back as many generations as you originally claimed! This recipe is very similar to angel food cake -- which we always made for my grandmother, who adhered to a low-fat diet. I can't wait to try it! It looks good. Cute trick with the bottle. At first I thought it was infusing some flavor into the cake. Wooo. That sure looks complicated to me. I'm not very skilled in the kitchen but occasionally take out the little note cards from my moms recipe box and try them out. I guess it's a way of connecting with her and my childhood. I also very much enjoyed your comment section. The blog world has helped to clear up a family mystery! Looks so yyyyummy! Thanks for sharing! I seldom bake cakes because I'm not good at making them. So I have been using the same baking powder for years. Shame! I'll buy a fresh one as soon as possible!! I sometimes bake banana cakes with lots of raisins. W2W, welcome back! So it wasn’t just my mom on noise. My kids usually lose interest after the first few minutes, but my son has helped me beat the egg whites. Phillip, thanks so much for the explanation! It makes sense. This cake has a wonderful texture, crispy on top and moist without being soggy inside. Pamela, my mixer is a Kitchenaid, but it’s at least 20 years old. I should put a new one to my X-mas list. I am soooo excited about the Julia Child movie. Bee, that helps to get the advice. I think this is the 3rd recipe I’ve posted but my first baking one. Note the 6 egg yolks – that’s the main difference between it and a fat free angel food cake. Tina, ha! Maybe a good idea for Henry’s birthday, but not for the kids. Troutbirder, comfort food is so evocative of childhood. Mary Ellen, now that is funny. I see Nessie too! Whatever happened to her? I like your update. This has been a great use of a blog, comments and all. Sapphire, my husband once baked banana bread without baking powder. My daughter called it a banana brick. That looks absolutely divine! My mouth is watering. I'm not a baker either. I keep saying one of these days because, like you, I had a mom who baked and baked well. Oh, the rising/non rising debacle. A couepl of weeks ago I baked a cake with my children (it was part of a Spanish language exercise) and the three of us saw the flour rise up and we were all over the moon. That lasted about one minute, though. The flour actually caved in, creating a crater that would not have looked out of place on the Moon. Your recipe looks nice and the fact that it's been passed from generation (even with that extre helping of sugar) makes it even worthier of keeping. Happy Birthday to your daughter! I love finding creative recipes! Looks delicious! Barrie, SFE: spring form envy. Alyson, my mother doesn’t bake often but still more than I do. Her apple pie at Thanksgiving was delicious too. ACIL, isn’t that so disappointing when it happens? Baking is not very forgiving. I actually had time to read this recipe carefully today. It sounds a delight and worth all the time spent in creating it. I bet your daughter was thrilled. I personally will risk getting salmonella to eat uncooked cake batter. One of the joys of my life. I feel it is quite possible to make cakes with a hand beater -but gosh it does take a lot of time and energy. Do you miss the self-raising flour you can get for cakes in England? Elizabeth, my mom buys self-raising cake flour in NYC from her local grocery store. I haven’t seen it in Maine. One of my daughter’s favorite ice cream flavors is cookie dough. I like to add the sponge cake cinnamon. fast cooker, welcome to my blog. Would cinnamon go with lemon? That looks delicious. Congratulations on baking it successfully! And happy birthday to your daughter! 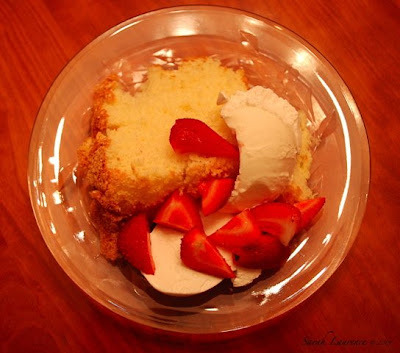 This brings back memories, Sarah: my mother used to make homemade angel food cakes. I watched her carefully fold in the egg whites by hand, then I licked the bowl clean. My favorite part, though, was the scrapings in the pan after the cake had been taken out. We were always told jumping around would make it collapse. Today I make it from a mix:) Your sponge cake sounds delicious, but alas, I no longer own a sifter! Donna, happy birthday to you too! Rose, yes! The kids and I love the crumbs. The last time I made Angel Food cake, I made it from a mix too. You can use a wire mesh vegetable strainer to sift flour the old fashioned way. I had a look for your books but couldn't find them on Amazon. Who are they published by? Anonymous, my agent is looking for a publisher for my novel S.A.D., and I’m still writing NOT CRICKET. Nothing is published yet, but I will post the happy news on my blog and website when/if it happens. Thank you for your interest! So funny. I have my mother's tube pan and was cleaning it yesterday - as I use it strictly for decor in a vintage display, along with other odd pieces I do not use. May have to try this one. Boomer, what a fun coincidence! Vintage pans and vintage recipes go together. I love these overlaps. Sarah, dear, that cake is a labour of love. You SHOULD be excused from baking for the rest of the year! Happy Birthday to your creative and sweet girl. JAPRA, can you sign a school note for me? You'll be pleased to know that our gift to our daughter was a camera. Kathryn, let me know how the recipe turns out. The photo is actually of egg whites and sugar as there is no cream in this low-fat recipe. The photos of everything, are to die for! Sarah, asante sana for watching my blogpost on my trip back nyumbani. That was so nice of you. Once I have completed a final Kenya Open For Business non-profit project towards the end of August, I am going full throttle with my first creative outlet...writing. MS, I’m a surreptitious finger licker too! You are an inspiration with your non-profit venture and creative writing. Love our posting today. I will be trying this recipe for sure. Anon, welcome to my blog and kitchen! Good tip about cleaning the pan. One more mishap I suffered came from using locally farmed tiny eggs. I prefer buying local but in baking the ratios are important and my cake ended up too dry and didn't sponge up.